There might not be jumpy castles, go-carts or batting cages, but make no mistake, Lillie Belle Farms, located in Central Point, is a fun center for your taste buds. Owner Jeff Shepherd, a long-time chef, didn’t start out wanting to be a chocolatier. He actually wanted to grow organic fruit. But when he purchased a berry farm, he couldn’t use all of the products he grew at local farmers markets, and started making truffles. Now, after mentions by Oprah, Martha Stewart among many others – many articles are framed on the walls of his N. Front Street shop – he is well on his way to being a world-renown chocolatier. But don’t think you are going to walk into Lillie Belle Farms (named after his daughter and wife) and find a white-coated serious man carefully sculpting a tiny truffle. Like the picture of Gene Wilder as Willie Wonka he has hanging in the store, Shepherd comes across more playful than serious – ready to laugh, have fun, and surprise you like the crazy-haired star of the ‘70s movie. Getting a sample from Shepherd is like getting a surprise party for your mouth. And be ready, because almost always there is a quiz after the experience. “What do you taste?” He asks quizzically, wanting to know how you experienced some of his specialty creations. Chocolate covered bacon, berries, poppy flowers from France, blue cheese from Rogue Creamery next door – there isn’t much Shepherd won’t lather with just the right amount of butter cream or chocolate. Oh, and don’t think for a second you can experience this by placing an order on his Website. Shepherd is known for spending so much time on perfecting specific tastes, that there is no way he can make mass quantities. Which is why the tall, long-haired, self-described hippy loves being his own boss – he is doing what he loves and having fun doing it. And it’s working out for him. 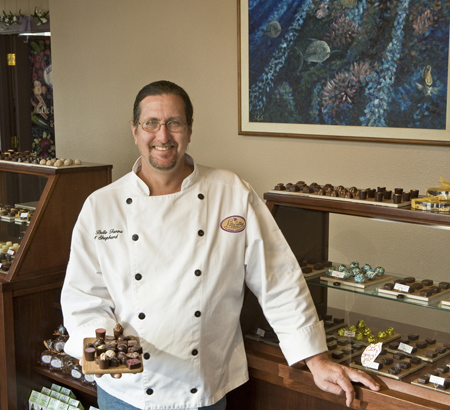 He was named one of the “10 best chocolatiers in the U.S.” by Dessert Professional magazine for 2009. Visiting Lillie Belle is a culinary discovery, and one that will satisfy just about any sweet tooth – just be careful of the chocolate covered peppers… they will clear out your sinuses. About Lillie Belle Farms: The chocolate store, located on Highway 99, or North Front Street in Central Point, opened its current location a few years ago to take advantage of what business owners in the area call an “artisan grouping.” Lillie Belle is located next to Rogue Creamery (who built the building for him) and it has big windows where you can watch Shepherd make his confections. What to bring: Your senses and an attitude to try something new. Don’t be afraid to experience different combinations that might not sound good on paper, but once they hit your tongue you end up going home with a box or two of the tiny delights. Getting there: The chocolate store is located at 211 N. Front Street in Central Point and is very easy to find. Tips: Shepherd and his staff are more than willing to talk about the different truffles and how they are made. Also there are giant windows into his kitchen, so if you come by from 11 a.m. to 3 p.m. you have a pretty good chance of seeing people creating some very special treats. Shepherd said he is more than willing to talk with people, just make sure you are patient, as there is a steady-stream of people coming through the shop.